Complete elements of different suppliers and different series can be combined in a so-called position framework. The framework is generated as a line model. The individual elements are inserted into this line model and linked with each other. 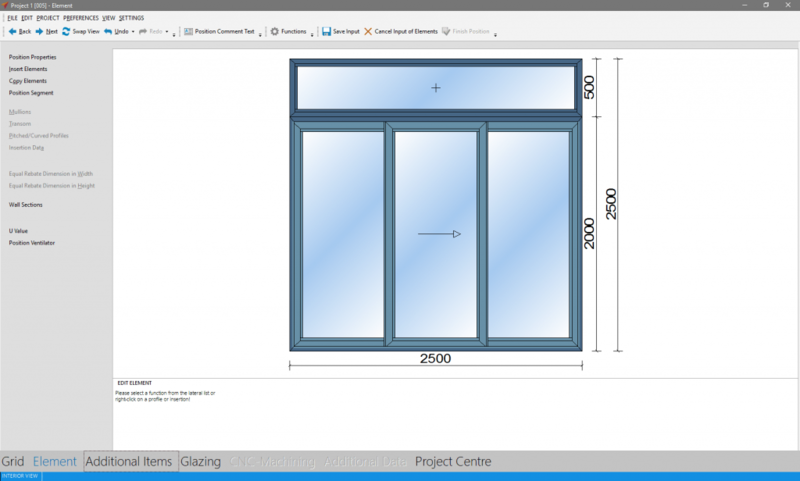 Thereby complete element curtain walls can be created, such as e.g. a combination of slide doors or fire protection series with elements from a window series within a position. 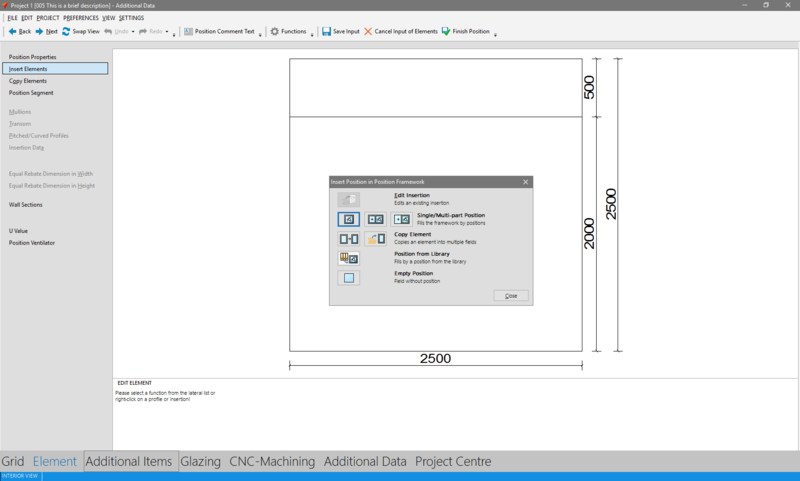 Click the arrow on the right hand side of the button „New“ in the project center’s toolbar and select the option „Position Framework“. 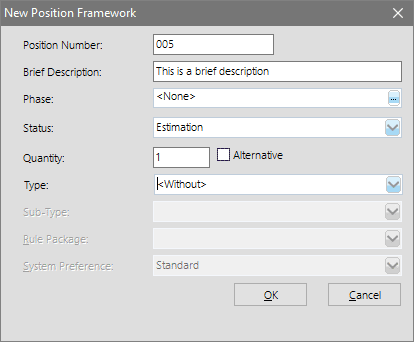 Enter the data for the position framework in the following window. The entry of a position framework is done similar to the input of elements. Determine the basic structure for the position framework in the grid input and click the button „Next“ in the upper left area of the toolbar. 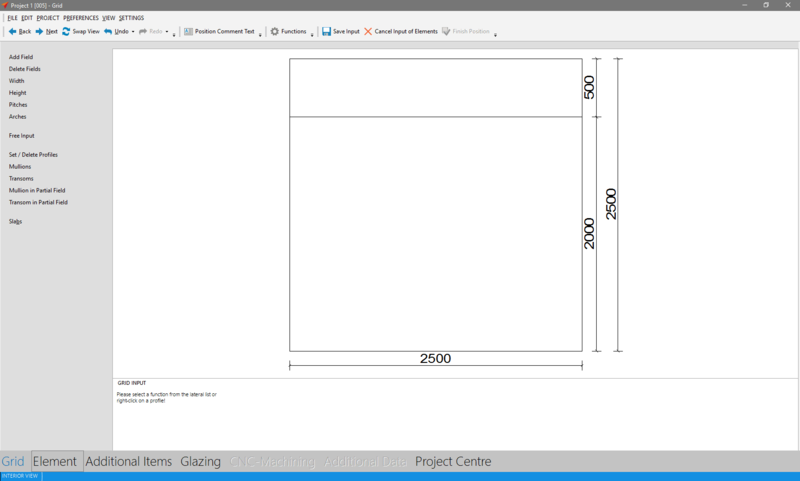 In the programme window „Element“ you can insert several positions into the line model via the function „Insert Elements“. For this purpose you have several possibilities at your disposal. Via „single / multi-piece positions“ you are able to create new elements. Subsequently select the field in the position framework, into which you wish to insert the position. Afterwards you get to the input of elements and can create the position as usual. Then you automatically get back to the framework and the position you just created will be inserted into the selected field. In order to copy an element and place it at another position within the position framework, click the button „Copy Element“. Select the element you wish to copy and click „Apply“ right below. Afterwards click the field in which the element is supposed to be inserted and then click „Apply“ again. You can insert elements from the position library. Click the button „Position from Library“ and select the according position that you wish to insert. 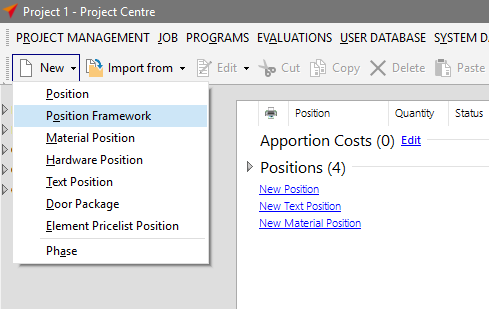 If you wish to create an empty field in the position framework, select the function „Empty Position“. After you filled all of the position framework’s fields, continue in the toolbar’s upper left corner. The following process is identical with the input of elements.